Maybe it was just one inning, eight pitches. But it was a good start. Brian Wilson made his debut in the Dodgers organization, pitching the first inning for Rancho Cucamonga on Wednesday against Lake Elsinore. Wilson has been sidelined for 16 months after undergoing Tommy John surgery in April of 2012. The Giants let him walk. So much for 171 saves and three all-star appearances in seven seasons. Wilson barely broke a sweat, getting a strikeout and the other two outs on routine grounders to second base. He was clocked between 89-91 mph. The next stop will be Triple-A Albuquerque. There is always a bit of a buzz when a major leaguer plays at a lower level on a rehab. And the Quakes have had more than their fair share. But Wilson brought more than the usual buzz, including a media contingent of about 20, 19 more than usual. Plenty of fans showed up, many wearing San Francisco Giants jerseys. Wilson got a nice round of applause as he took the field. Maybe it was that flamboyant personality or the fact that the once-hated rival was now a part of a team so much a part of the Southern California landscape. After pitching and talking to the media, he signed autographs for about 20 minutes on his way out. One outing doesn’t mark a complete return, but it’s a good start. Poor Ryan Mount can’t catch a break. 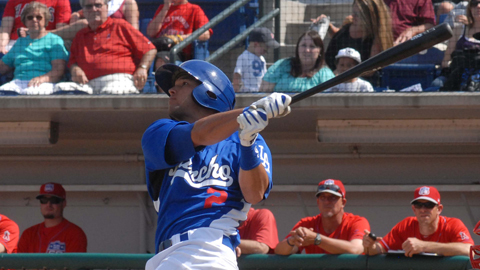 The Rancho Cucamonga third baseman got back in the Quakes lineup after missing nine weeks with a foot injury. And what happens? He gets hurt again. The Ayala High School grad apparently got hurt sliding into third base in the fifth inning, according to manager Carlos Subero. Not only did Mount not say anything, he stayed in the game. He was serving as designated hitter so he went in the clubhouse and rode a stationary bike to stay loose. He also almost beat out an infield hit later in the game. “That shows just how tough he is,” Subero said. At the same time the Quakes were hitting and prepping for a game against Lake Elsinore on Wednesday, Mount was seeing a doctor. Subero said the injury is likely a torn ACL. Mount turns 27 in 10 days so it is possible that serious of an injury could be career-ending, especially in such a competitive field as professional baseball. Mount was hitting . 342 and made the all-star team when he was injured. Before last night he last played on May 31. Mount was in the Angels organization up until last year. Everyone in both organization’s was bummed about the players’ latest setback. Former San Francisco Giants closer Brian Wilson will start his comeback tonight at LoanMart Field where the Los Angeles Dodgers California League affiliate Rancho Cucamonga (52-63) will be hosting Padres affiliate Lake Elsinore (51-63) at 7:05 p.m.
Wilson, 31, signed with the Dodgers on July 30, five days after throwing a bullpen session to show he had sufficiently recovered fro Tommy John surgery he underwent in April of 2012. It was the second Tommy John surgery for Wilson, who first had the procedure done in college. Don’t arrive late. Wilson, who recorded 171 saves in 314 career games with the Giants, will start the game but likely only pitch an inning. Wilson will be followed to the mound by the regularly scheduled starter Freddie Cabrera (2-2, 5.05). There was a lot of roster moves made by the parent club Dodgers to the Rancho Cucamonga roster. The most notable move for local baseball followers is that third baseman Ryan Mount came off the disabled list. The Ayala High School grad was having a career year (hitting .342) when he injured the same foot he had surgically repaired two years ago. He was in the starting lineup on Tuesday for the first time since May 31. Right-handed pitcher Edwin Carl has been signed to a free agent contract and assigned to Rancho Cucamonga while another right-hander, Craig Stem, has been transferred to Rancho Cucamonga from Class-A Great Lakes of the Midwest League. Outfielder Devin Shines has been transferred to Great Lakes while infielder James McDonald has been transferred to Rookie-League Arizona. The minor leagues are all about player development. That has always been clear. Yes winning a championship is nice but the priority is getting players ready to move on to the next level so they can eventually help the parent club. Players want to climb the ladder as quick as possible and for most, playing in the High-A California League still seems like it’s pretty far from the big leagues. But some promotions don’t seem to make sense. For example, pitcher JonMichael Redding of Rancho Cucamonga would seem to warrant a promotion. He pitched shutout ball against Inland Empire on Sunday and lowered his ERA to 2.00. He would be the top pitcher in the league when it comes to ERA if he had enough innings to qualify but has been used primarily as a reliever. When the parent Dodgers had a chance to promote a starter earlier his month it chose to move up Garrett Gould, holder of a 2-7 record and 7.04 ERA. Redding, 25, is in his fourth year in the Cal League and has been putting up good numbers this year. Gould, who turns 22 later this month, was in his second year and his numbers with the Quakes were worse than they were last year. Well it’s all about money. Gould was a second-round draft choice so the Dodgers have more invested in him. The higher the draft pick, the more chances that player will get to prove himself. Not that Redding was a slouch. He was a fifth-rounder. The same can probably be said for reliever Eric Cendejas of the Sixers. He has had two solid years in the Cal League. He had a 2.87 ERA in 47 appearances last year and has a 2.74 in 34 this season. Yet two Sixers relievers have been promoted ahead of him. Granted both those players had numbers worthy of promotion, unlike Gould. But still Cendejas was a 33rd draft choice. He has to wonder when his shot will come. Sometimes players have to hope if their numbers don’t them promoted in one organization, maybe another will take notice and they can get a shot elsewhere. Right-handed pitcher Garrett Gould has been promoted by the Dodgers from High-A Rancho Cucamonga to Double-A Chattanooga of the Southern League. Gould was just 2-7 with a 7.04 ERA in 15 starts this season. Given that record the promotion is a little hard to comprehend. Gould was also with the Quakes last year with only moderately better success – 5-10 with a 5.75 ERA. Maybe the Dodgers feel a change of scenery and a different mentor will help. A move to the bullpen is also a possibility. That seems to be a common move when a pitcher is struggling. Gould was a second round draft choice in 2009 and was ranked as the organization’s No. 11 prospect in 2012 according to Baseball American. Maybe the Dodgers feel it’s time to sink or swim. His place on the roster will be taken by Bobby Coyle, who has bounced back and forth between Rancho and Chattanooga this season. There is plenty of excitement over Thursday’s exhibition game at the Epicenter and rightfully so. The Dodgers are coming to Rancho Cucamonga. Of course, Quakes fans have been treated to some high-profile rehabilitation guys last year, including Matt Kemp and Andre Ethier. But this is an entire Dodger team, although several of the regulars will be playing in the Freeway Series the same night against the Angels. But, this is not the first time that a big-league team has come to Rancho Cucamonga to play the Quakes in an exhibition game.